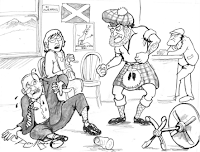 Power and its Minions: What Do Others Think of the Scots? Recently, I did a post that asked the question ‘Why to People Dislike the English?’ In the interest of balance I think we should now look at the Scots. What do the people of other countries think of us? Do they like or dislike us? If so, do we bring it on ourselves? This enquiry was triggered by the recent story about the Scottish Government complaining about how Scots are often portrayed in Germany as penny-pinchers, with the rock-bottom price usually described as the Schottenpreis. Personally, I was surprised at the complaint, as I’ve always regarded this marketing device as a reflection of the Lutheran admiration for their Calvinist cousins’ supposed thrifty ways and, as they say, any publicity is good publicity. It is certainly not meant as hostile. I therefore set out to conduct a survey. I should admit up front that my approach was fairly unscientific and consisted mainly of getting people drunk and asking them questions. The first part of my survey is based on what I managed to extract from my English cousin. It should be stressed that he’s a proud Yorkshireman, so he sees England somewhat as an outsider. He was at pains to point out that this is not what he personally thinks, but merely what he understands how many of his countrymen feel, many of whom he considers ‘soft southern bastards’. Regardless, this is what I managed to get out of him after four beers. Note the attributes that did not come up in the Euro survey: dour, parasitic, socialistic, grasping, chippy, boastful. Note too the qualities that are not recognised by the English in the Scots: friendly, hospitable, direct and plainspoken, generous. So do we put on a different face for the English? Or do we have more in common with our European neighbours? Or perhaps is there some truth to the idea that every observation is an expression of difference, not of an absolute quality? That an observation can say as much about the observer as the subject? For example, I know a Frenchman who thinks the English are two faced, mainly because their smiles are not necessarily invitations to friendship. The Englishman would see this as French surliness, which is not a far cry from a perception of dourness in the Scots. A. ‘Honest with a strong sense of what’s right and wrong’: could be easily seen as ‘sanctimonious’ by someone who does not feel they have to demonstrate their honesty, or by someone from a culture where deceit is admired as cunning and guile. B. ‘Like to debate’ could easily be interpreted as ‘argumentative’ by someone more used to the wishy-washy pass-the-tea-vicar conversations on the weather that often pass for conversation in England. C. ‘Proud, often passionate about their history’ might easily be seen as ‘chippy’ if that pride is at variance to the Englishman’s opinion of Scotland as a cultural and historical vacuum with nothing to brag about, and he is tired of having his long-held school-taught prejudices corrected. This reminds me of how, in the pre-Civil Rights America, white Southerners used to describe proud blacks who asserted their equality as ‘uppity’. - How Scots do indeed react sometimes to Englishmen. Note, however, the qualities that came up in both surveys: anti-English and drinking too much. Maybe there’s something to these after all. They do say the first step in getting help is admitting you’ve got a problem. Personally, I consider the anti-English thing as a form of frustrated Scottish national identity, the natural result of four hundred years of being told your culture is inferior to another, and resenting it. (2) If that situation were to end, the sentiment would surely fade with time. What I don’t agree with is the common English assertion, based on a complete ignorance of the subject, that Scottish nationalism is anti-English or xenophobic. If it were, it would not be enjoying its current popularity as a movement. Neither would this explain why so many English people in Scotland support it. Or the English members of the SNP. If anything, the SNP message to Scots seems to be ‘check your anglophobia at the door’. Bring on independence and mutual respect. (2) This is recognised by historians as a direct result of the Scottish crown moving to England in 1603, and taking the Scottish cultural elite with it. Interesting post. The relationship between Canadians and Americans is similar to that of the English and Scots. Possibly the result of having a very much larger southern neighbour who likes to have their own way in things and doesn't actually know much about their northern neighbour other than stereotypes. Arrogant and ignorant would be the adjectives most used by Canadians to describe Americans. Canadians, like Scots towards the English, like to stress the differences between them and Americans even adopting some Scottish pronunciations and claiming them as their own. Aboot for about - that kind of thing. Canadian independence, though, has prevented a hostile relationship from developing. Also the ubiquity of American media ensures attitudes towards things are fairly similar. I certainly would agree with the foreign view of us Scots. Then again, I've stopped giving any attention to the adjectives the English use for us. I think you're right - it sounds like a very similar phenomenon. A kind of big brother-little brother thing. The population ratios would probably be similar too - what, about 10:1? It's probably the same relationship as Australia & NZ - arrogance & ignorance, and the inevitable backlash. What I did not include was what the Europeans thought of the English as a people. To avoid accusations of anglophobia, I won't repeat it here. But all quite strong opinions. And not very complimentary at all. And the reaction to the question 'can you tell the difference between English and Scots?' was one of incredulity. 'Are you kidding? You're completely different!' was pretty much the response all round. You probably see more German tourists in the Scottish highlands than any other, apart from the English. But the stereotype of the mean penny-pinching Scot is one that exists in Germany. I've usually found Scots to be generous, especially when they're at the bar, so presumably the supposed frugal-ness of Scots is a relic of more Presbyterian/Calvanist times (Germany was similarly afflicted). I used to think the tight Scotsman caricature was an example of England exporting its prejudices to the world (e.g. the thick Irishman) but it simply isn't true. Apparently, for hundreds of years before Scotland's Union with England in 1707, there were tens of thousands of Scots in France, the Low Countries, Germany and Scandinavia, many of them there as educators or merchants. Due to the poverty of their country back home the merchants would offer very competitive prices for their wares. This has endured as a folk memory in those cultures. So we'll have to let you off with this one. Outlander, personally I can see all the observations applying to us. We're a very complicated people!